In the late 1930s, the major European powers all undertook the development of a new generation of fighter aircraft. In Germany, this development resulted in the Messerschmitt Bf 109. In Britain, the Hawker Hurricane and Supermarine Spitfire. And in France, this development coalesced, too late, around the Dewoitine D.520. The lack of an engine on par with the Daimler DB 601 or the Rolls-Royce Merlin combined with numerous developmental delays kept the first D.520 from rolling off the production line until October 1939, and even then, it wasn’t declared combat ready until April 1940. When the Germans invaded France on May 10, 1940, only 228 D.520s had been produced and of these, the Armee de l’Air had only accepted 75. In the air, the D.520 could hold its own against the Bf 109E-3, but its limited numbers translated to limited effectiveness. By June 1940, France capitulated. After the Armistice, something somewhat unique happened. A number of pilots flew their D.520s to North Africa – and a smaller number to Britain – to avoid capture and form the nucleus of the Free French Air Force. Meanwhile, the Vichy regime continued production of the D.520 for its own use. This eventually led to a rare and possibly unique occurrence in the war – pilots of opposing sides flying the same aircraft against each other. Several more D.520s were given to the Regia Aeronautica, the Romanians, and even served as trainers for Luftwaffe pilots. By early 1943, however, they were phased out of frontline duty with the allies, and the Free French were graduated to first P-40s and then P-47s as the war moved back to mainland Europe. While the Messerschmitt Bf 109, the Spitfire and the Hurricane all flew into legend, the Dewoitine D.520 became little more than a footnote in the history of the Second World War. Since my return to modeling, I’ve heard occasional mention of the D.520 being one of the finest kits Tamiya has ever made. I don’t know about that – in 1/48 alone their P-47 line is difficult to top – but the D.520 certainly appears right at home in their mid-90s line of what I call “two-sprue wonders” such as the F4F Wildcat and P-51 Mustang. These kits tend to share similar characteristics – excellent exterior detail, excellent fit, competent-but-not-amazing cockpits, and a low parts count that enables them to fit, in their entirety, on just two sprues. Conceptually, they’re a far cry from where Tamiya’s operating these days, and in my mind they’re a sweet-spot combination of the simplicity of the old Monogram kits and the detail and fit of Tamiya’s latest. Of course, being a Tamiya kit, the decals are crap and a half, so I’m taking a chance on some replacement markings from Berna Decals. Sadly, there are no lofty reasons behind why I’m tackling this particular kit at this particular time. There’s a French aircraft group build kicking off over on FSM, for one thing. For another, I really dig the gray-blue, brown, and khaki green camoflage scheme. 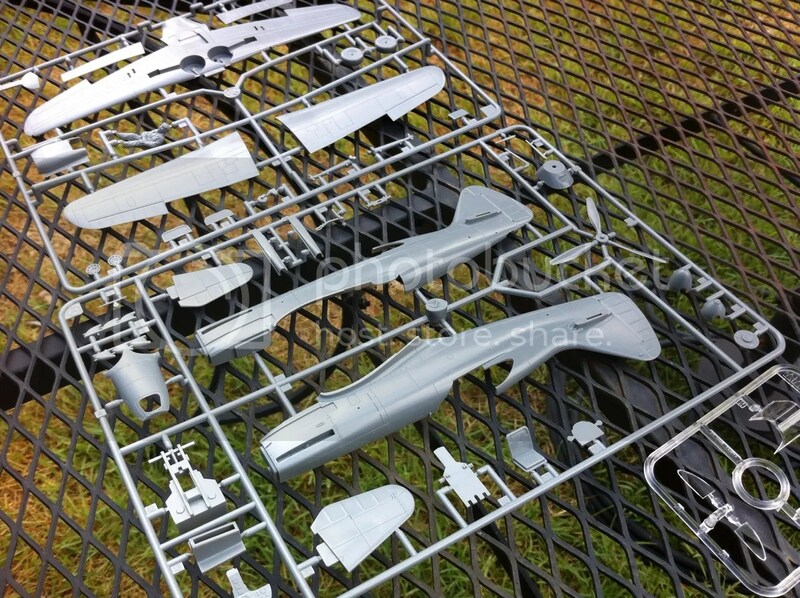 That and I’m hung up for the moment on the P-51B and B-25 builds as I await a few items from Sprue Brothers. I also had a lot of fun building some other quirky footnote aircraft of late – namely the Fiat G.55 and the Lockheed PV-1 Ventura – and who knows, maybe lightning will strike again!